Those who cook regularly, know how important it is to pay attention to small details. Whether it is something as simple as not storing onions and potatoes together (as the moisture from potatoes can make the onions rot) or freezing nuts before chopping them, a little really does go a long way. Here are ten more tips on simple, every day kitchen things, to make sure the time you spend cooking is a smooth affair. Always crush or finely dice garlic when adding it to dishes. Crushing breaks more cells and releases a higher amount of sulfide-transforming enzymes that are responsible for the pungent, rich flavour. To get the maximum juice out of a lemon, roll it vigorously under your palm for about a minute before you squeeze out the juice. Greens like spinach, lettuce, methi wilt quickly, even when refrigerated at the most optimal tempertures. To prevent this, wrap your greens loosely in newspapers and pack them in plastic bags before you store them in the ‘crisper’ compartment of the fridge. When sautéing veggies or meat, if you find you need to add more oil to the pan, do not add it in the centre. Pour oil in a stream, from the side of the pan. This way, the oil gets heated by the time it gets to the ingredients that are being cooked. 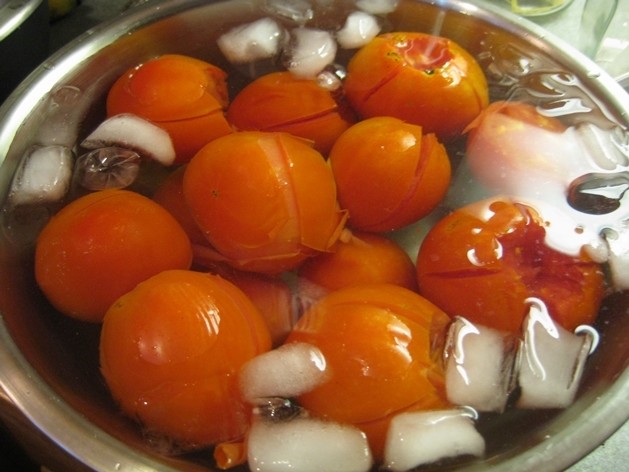 Do not refrigerate tomatoes. A recent study reported that refrigeration alters the volatiles and texture in the tomatoes, making them lose that fresh flavour. It’s better to leave them out on your kitchen counter, as it will only help to improve the flavour (up to a certain point). Add a pinch of salt to water before boiling eggs or potatoes. It will help get the peel off without too much of a hassle. Forgot to soak chickpeas overnight? Soak them in boiling water for an hour and you’ll be good to go. Try to shallow fry foods as much as possible. In situations where deep frying is a must, add a pinch of salt before frying, this will reduce the amount of oil absorbed by the ingredients being deep fried. To reduce total salt intake, add salt at the very end of the cooking process. This also helps prevent unnecessary dehydration of veggies and keep their nutritional value intact. Grating cheeses like parmesan, mozzarella or even the regular store-bought cubes of soft cheese can be a messy job, since a lot of it sticks to the grater. To prevent sticking, apply a dab of oil on the surface of the grater.